UPDATE 2015-05-12: I found an even better solution! I’m an Evernote junky. I live in Evernote and have done since I first discovered it on September 11, 2008. As someone with a terrible memory chip, I use Evernote as my plug-in brain. It stores everything I see, hear, read and every idea I ever have. 1. Turn on your phone. 2. Find the Evernote app and click on it to open. 3. Wait a few seconds for it to load. 4. Click the tiny plus button in the top right-hand corner to create a new note. 5. Click in the body of the note to activate the recording functions. 6. Click the tiny and almost invisible audio recording button at the top of the screen. 7. Record what you want to say. 8. Hit the tiny “done” button in the top right-hand corner of the screen. 9. Hit the “Close” button to save the note. If I went through this process every few minutes while driving, I’d survive about a week. So I was looking around for an iPhone audio app that would allow me to record and sync with Evernote with one click. And I think I’ve found it. First I made sure that my Evernote “Email Notes to” address was listed under my Contacts app as “My Evernote”. Now I can just activate Siri and say “Email to My Evernote……” and tell it what to say. Siri asks if I want to send it, I say yes and I’m done. 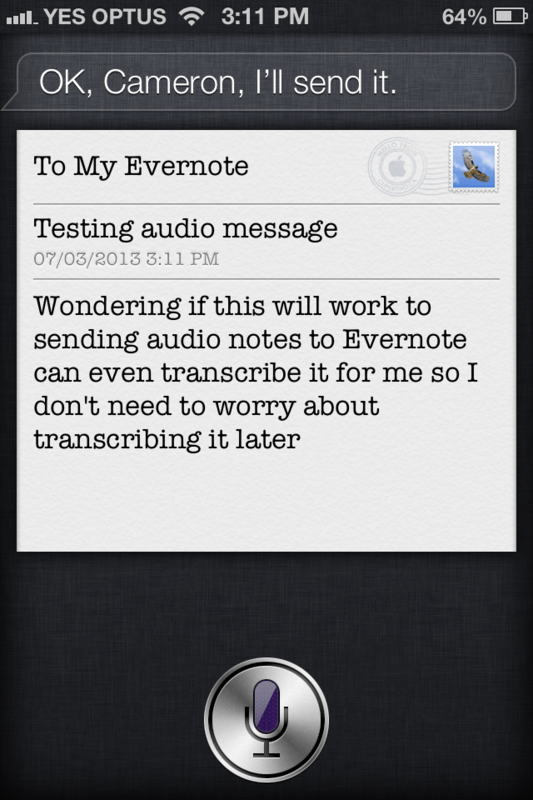 Added benefit: I don’t need to transcribe the note when I’m back in Evernote on my Macbook – Siri does the work for me! Thanks to @jjprojects for the hint! Thanks for that Cam. I’ve set it up. Might come in handy from time to time. I find it easier to just say ‘take a note’, then use one or two brain cells to remember I made something in notes and move it over later if i can be bothered. It also adds a certain je-ne-sais-quoi to the ‘having a butler’ feel. Although i also find that siri is very hard to use for anything other than basic ios commands like ‘take me home’ when driving. I still end up having to touch my phone to edit things, due to the background tyre and engine noise, which is a) dangerous and b) illegal in the UK (and for good reason – i think similar laws are going over the pond soon). Maybe its just the crappy bluetooth in my admittedly sub-apple standard aygo.